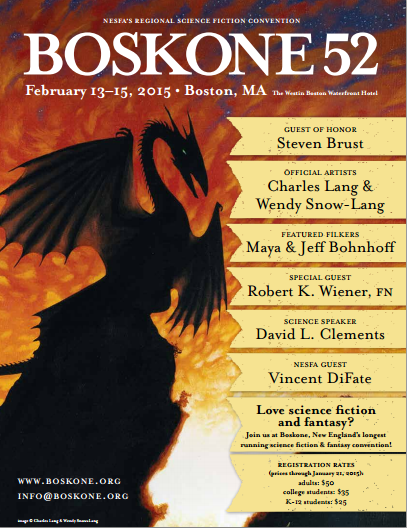 Boskone is starting early this year, which means more programming and more fun. So, mark your calendars with the magic number: 2.13.15 at 2:00 pm because that’s when program panels begin. Panels begin at 2:00 pm: featuring everything from Manga to Science, Science Fiction, Fantasy, Harry Potter, Doctor Who, Young Adult and Children’s programming…and more! Even better, everything is free to the public from 2:00-6:00 pm on Friday; memberships are needed after that. Did we mention late night chocolate? Register Today for the Pre-convention Rates! Rates increase after January 21st. This entry was posted in Boskone 52, Program. Bookmark the permalink.